Recent parliamentary elections in Denmark resulted in the formation of a minority government led by Prime Minister Lars Løkke-Rasmussen. His liberal Venstre party came in third while Social Democrats continue to be the party that holds most votes in parliament without having a majority. Løkke-Rasmussen’s minority government will have to rely heavily on cooperation with the populist right wing Dansk Folkeparti (Danish People’s Party). Løkke-Rasmussen was, during the 1980s, one of Denmark’s most prominent fund-raisers for the “mujahedeen” who were fighting Soviet troops in Afghanistan. That is, early Taliban elements and most prominently, Osama bin Laden’s Al-Qaeda. In 1988 Løkke-Rasmussen would cross the border to Afghanistan on horseback and deliver some 600,000 DKK to the “mujahedeen”. The Danish anthropologist Inger Boesen would state that Lars Løkke-Rasmussen’s and other westerners’ fund-raising contributed significantly to the long-term developments in and the destabilization of Afghanistan. Among his fellow Danish fund-raisers was Pia Kjærsgaard who until two years ago was the chairman of the very Danish People’s Party that the Løkke-Rasmussen government has to rely upon to avoid a swift new round of elections. Lars Løkke-Rasmussen and Pia Kjærsgaard were, throughout the 1980s among those Danish politicians who would arrange semi-annual protests at the Soviet Embassy in Copenhagen. The fact can hardly have escaped the former KGB officer, now President of the Russian Federation, Vladimir Putin. 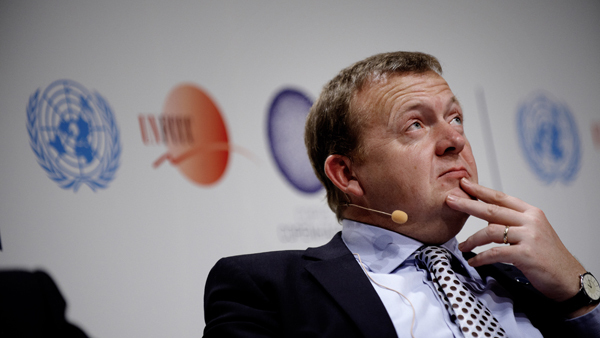 Lars Løkke-Rasmussen was also Denmark’s PM when an almost unanimous Danish Parliament voted for Denmark’s participation in the implementation of the “no-fly-zone” in Libya that had been authorized by UN Security Council Resolution 1973 (2011). The only party that voted against was Enhedslisten (Unity List) which is a red-green alliance of small socialist, communist and green parties. It is noteworthy that the author, in 2011, sent letters containing the United Nations’ list over persons who were sanctioned due to ties to Al-Qaeda and the Taliban to the select committees for foreign affairs of all major parties in Denmark. Underlined were the names of those on the list whom the NATO-led alliance suddenly promoted as “the Libyan opposition” and “democrats”. The document contained passport numbers, alias, alternative passport numbers and more. Consequentially, non of these parties can today argue that they did not know whom they supported. No blow-back theory can be justified – one should rather talk in terms of a blow-job. The then PM and newly re-elected PM Løkke-Rasmussen would go as far as to justify “the Danish military effort” from the pulpit of a protestant church. It is a rarity that one can witness Vladimir Putin being about to be loosing it. Those who closely observed the joint press conference of Putin and Løkke-Rasmussen during Putin’s 2012 visit to Copenhagen would, however, notice that Putin’s knuckles were turning white when Løkke-Rasmussen justified NATO’s endeavors in Libya. Putin would respond asking who had given NATO the authority to implement regime change and murder Qaddafi.